New NTeX 4.1. makes work with automatically recognized text much easier. Furthermore, speech recognition runs significantly faster on high traffic Internet lines. 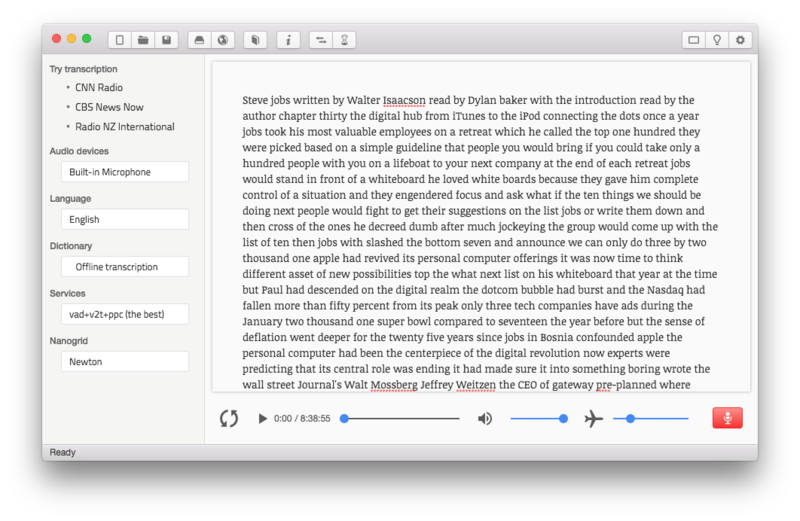 The version also offers automatic transcription for Spanish, supporting now 18 languages in total. After starting the application you can see the first enhancement – easier user interface. You do not need to switch into the correction mode anymore. You can simply correct text while the speech recognition process is still running. We have also improved the work with audio. Audio player is being automatically updated with new audio content every 30 seconds during the transcription. Time remaining to the next audio update is being displayed within the icon with two circled arrows symbol. By clicking this icon you can try speeding up the update of the audio player content. Smart text control has been added. The application displays the text continuously as the new text from the recognition process arrives. However, if user starts working with the recognized text, that mode deactivates and the priority is assigned to the displaying of text on the position of manual correction. To come back to the mode displaying the latest transcribed text the user simply clicks at the end of the text. End of sentence – repeated use of CTRL/CMD+T shortcut either adds a full stop, a brake and makes the first letter of the following word capital or adds a comma or deletes a comma or a full stop. Capital / small letter – CTRL/CMD+G shortcut makes the first letter in the word capital or small. Delete a word – CTRL/CMD+K shortcut deletes a word. Split a line – CTRL/CMD+L shortcut splits the text on the new line. It adds a full stop and makes the first letter of the first word on the new line capital. Correct a word – CTRL/CMD+E shortcut shows the menu of alternative words for quicker correction. The application also remembers preferred alternative for given word to display it on the first position in future. Please see Corrections in the menu for more possibilities. You can open the file using drag and drop into the application or icon in the dock in macOS platform. Active icon in the dock on macOS platform offers basic functions of opening a file or starting automatic transcription of a file or a stream. In case of the audio play speed adjustment you can reset by clicking the airplane icon. Simpler form of communication with servers enables much faster transcription even when using high traffic Internet lines. And one more new feature – we have added the full support for automatic transcription of Spanish including the spellcheck vocabulary and the link of news radio channel in Spanish for transcription tests. Would you like to try it on? Contact us: https://www.newtontech.net/en/trial/. We are able to transcribe spoken texts with high accuracy. We specialize in Slavic languages in particular, but our portfolio also features a wide range of other languages. We provide solutions for dictation and for the automatic conversion of audio recordings into text formats.